We are endlessly fascinated by the get-gorgeous routines employed by the ladies of yore — things seemed so civilized and involved back in the day. 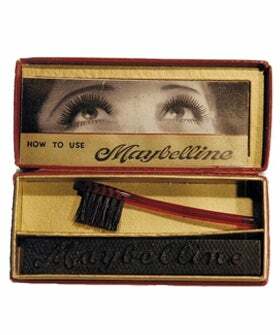 Plus, it's kind of nifty to see how things like lipstick and mascara have evolved over the years. Perhaps BuzzFeed sensed our curiosity, as they recently posted a treasure trove of vintage mascara photos that are so not what you're used to seeing. Instead of the lovely liquid formulas we have these days, the early incarnations of mascara were powder-based and not unlike a wet/dry eyeshadow: Add a little water to that sucker, and then paint your lashes on. We're having a full-on Daisy Buchanan moment right now just imagining this. For those of you who prefer ceremony to convenience, there is a way to replicate this ritual in 2012, thanks to Hourglass' Film Noir Lash Lacquer. Instead of a standard spoolie, it uses a little brush, which allows you to really get in there and attack those formerly invisible lashes.